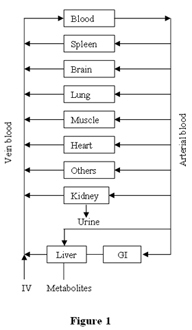 This PBPK model includes veins, arteries, kidney, brain, intestine, liver, spleen, muscle, lung, heart. The lines in the figure represent blood flows. Methadone is primarily metabolized in liver whereas the elimination of methadone and its metabolites occurs mainly through the kidneys. Organs in which methadone are not distributed (skin, adipose, skin, thyroid, pancreas, bone tissues, red marrow and yellow marrow), are lumped into one compartment shown as “others” in the diagram. Figure 2: Illustration of average body weight, body height and 12 organ volumes along with the population data as a function of age. The data on height and weight are collected from ICRP(2002), NHANES III survey (11456 records for male, 11034 for female), ILSI human database (538 records for both genders) and data from the literature (38, 40, 42). Blue points represent male; red points represent female. Those records with unidentified genders are represented by black points. Organ volumes are computed as a function of age, height, weight, and gender for all 23028 records using the regression equations described in the Table I. Within each panel, small numbers of experimentally determined organ volumes are also shown by black points. 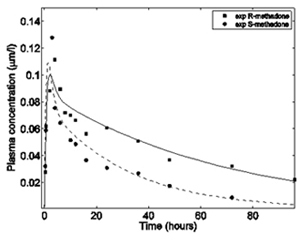 Figure 3: Illustration of predicted plasma kinetics for both (R)- and (S)- methadone. The data were obtained from a healthy 25 years old female subject, weighting 56.8 kg body, given 0.2-mg/kg single oral dose of racemic methadone (11, 27). The optimized enzyme velocities (Vmax) are 9.43 10-3 and 2.76 10-3 μmoles/min/mg protein and the partition coefficients of muscle are 5.75 and 3.898, for (R)- and (S)-methadone respectively. 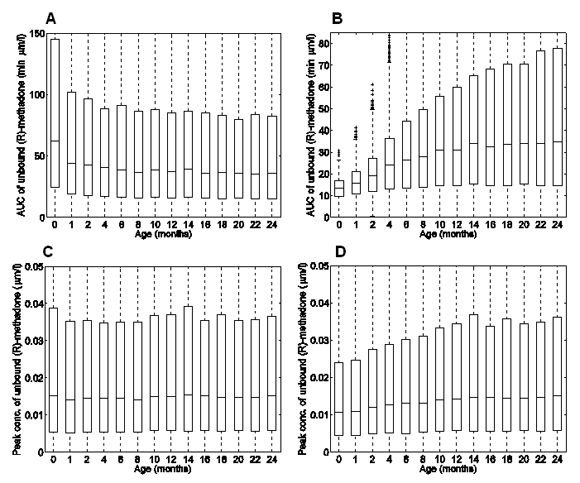 Figure 4: Illustration of predicted results of steady-state pharmacokinetics of methadone. A: Predicted time course curves of plasma concentration in methadone maintenance patients are illustrated. Data shown are mean values from 18 patients are given a normalized 70 mg racemic methadone every 24 hours (27). The steady-state is assumed to be achieved in 10 days. B: The time course curve for the tenth day is illustrated. Enzyme velocities (Vmax) are set to 1.67 10-3 and 0.56 10-3 μmoles/min/mg protein, and partition coefficients of muscle are set to 4.32 and 6.07, for (R)- and (S)-methadone respectively. Figure 5: Illustration of predicted results from multiple methadone injections of different type. The clinical data in A are from Kristensen et al. (10) (patient 4, female, 57 years old, 60 kg body weight, 160 cm height, given 20 mg IV racemic-methadone at 0 hours and 40 mg orally at 48th hours). Data in B is from a different subject in Kristensen et al. (10) (patient 5, female, 62 years old, 70 kg body weight, 166 cm height, given 10 mg oral dose at 0 hours and 10 mg IV at 48th hours). The absorption rate (Ka) is set at the maximum value of 0.1 for both subjects. Plasma ORM2 concentration is set at 2.855 μmol/L. Enzyme velocities (Vmax) are set to 0.49 10-3 and 0.26 10-3 μmol/min/mg protein, and muscle partition coefficients are set to 1.32 and 8.53, for (R)- and (S)-methadone respectively. 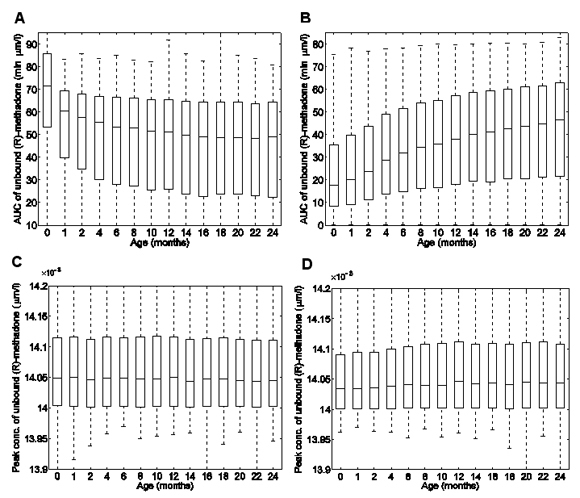 Figure 6: Predicted kinetics and disposition of methadone in a female infant aged 6 months. This female infant has 7.18 kg body weight, 65.4 cm body height, and was given an oral dose of 0.2-mg/kg. A: Predicted time concentration profiles following an oral dose in different organs are plotted. Lung, liver, spleen and kidney have higher concentrations than vascular-poor organs-brain, intestine, and muscle. B: The mass fractions of methadone in each organ/tissues as a function of time are illustrated. The legend of Figure 6B is the same as for Figure 6A. The inset shows the mass fraction in intestine, spleen, kidney, heart and artery, over the time scale of 0 to 20 hours. Liver, lung and muscle are the major repositories after peak plasma concentrations are obtained. Figure 7: Predicted plasma concentration-time curves for 14 individuals aged 0, 1, 2, 4, …, 24 months. A: Predicted plasma concentrations are plotted as a function of time, assuming CYP3A4 is the only enzyme contributing to the metabolism of methadone. B: Predicted plasma concentrations are plotted as a function of time, assuming both CYP3A4 and 3A7 enzymes are involved in metabolizing methadone. C: Predicted plasma concentrations are plotted as a function of time, assuming CYP3A4, 3A5 and 3A7 enzymes are all involved in metabolizing methadone. In all cases, infants are administrated 0.2-mg/kg oral dose of racemic methadone. Body weights, heights, organ volumes, and partition coefficients are chosen as the population means at each age. 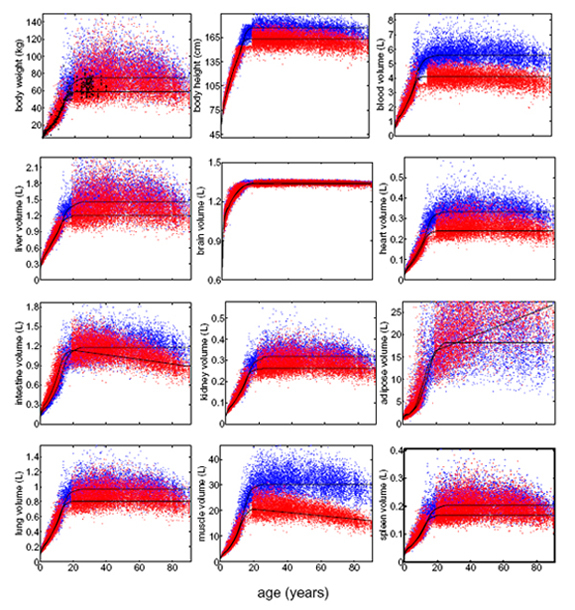 Enzyme expression levels and binding protein concentrations are properly scaled from adult average values. Figure 8: Illustration of methadone AUC and peak plasma concentrations of unbound (R)-methadone over populations aged 0, 1, 2, 4, …, 24 months. A and B: Whisker plots of AUC as a function of age for each population are shown, with the lines of box representing the lower quartile, median, and upper quartile values, the lines extending each end of the box showing the extent of the rest of the data, and “+” representing the outliers beyond the ends of the whiskers. C and D: Whisker plots of peak plasma concentrations are plotted as a function of age. The left panel (Figure 8A and 8C) illustrates predictions where only CYP3A4 is considered to metabolize methadone. In the right panel (Figure 8B and 8D), both CYP3A4 and 3A7 are assumed to metabolize methadone. In all cases, 5,000 individuals are sampled at each age, and each individual is given 0.2-mg/kg racemic methadone. Figure 9: Prediction of methadone PK based on optimally designed dose. The left panel (Figure 9A and 9C) illustrates predictions where only CYP3A4 is considered to metabolize methadone, while in the right panel (Figure 9B and 9D) both CYP3A4 and 3A7 are assumed to metabolize methadone. A and B: With optimal doses, AUC of unbound (R)-methadone decrease with age when only CYP3A4 is the metabolic enzyme, while it increases with age when both CYP3A4 and 3A7 are involved. C and D: The variances in peak plasma concentrations virtually vanish if ORM2 concentration, CYP3A expression levels, and other clinically measurable parameters are known a priori and the optimal dose is computed. Yang F, Tong X, McCarver DG, Hines RN, Beard DA. Population-Based Analysis of Methadone Distribution and Metabolism Using an AgeDependent Physiologically Based Pharmacokinetic Model. Journal of Pharmacokinetics and Pharmacodynamics, 2006.